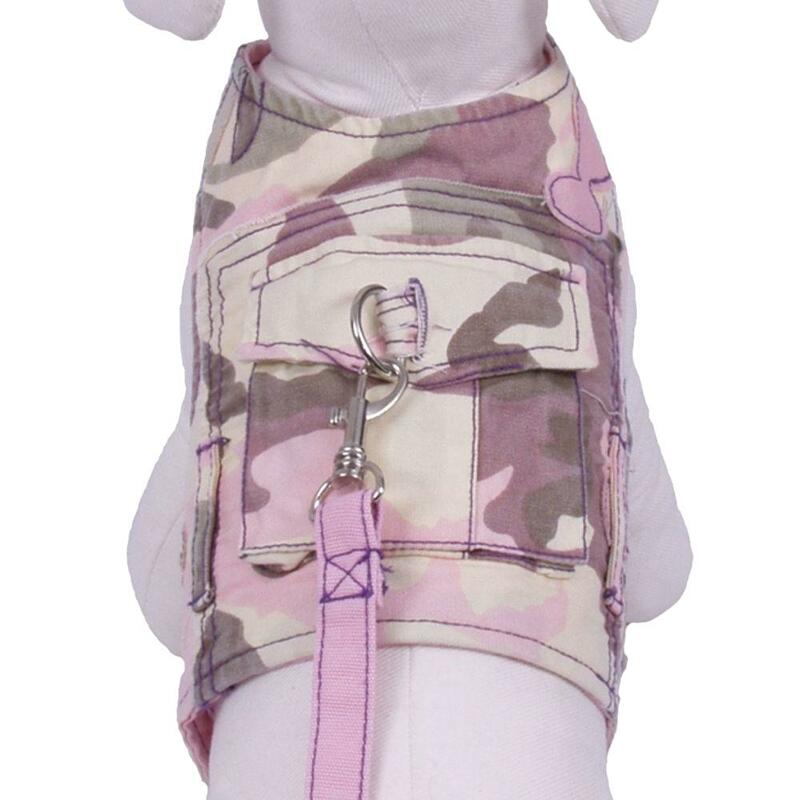 Simultaneously tough and cute, this fashionable Pink Camo Dog Harness with matching leash by Cha-Cha Couture will get your pup noticed! 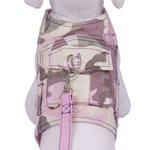 This Combat Doggy Harness in a pastel-patterned camouflage is definitely a head turner. Your dog will not go unnoticed while venturing through the streets and parks of your neighborhood. This comfortable vest style dog harness goes on easily with touch fastener at the neck and chest. The pocket is useful for holding treats or waste bags. This feminine version of camo features shades of pink, lilac, sage, and ivory. Each harness has its own fun style! Comes with matching lead too! Combat Dog Harness with Leash by Cha-Cha Couture - Pastel Camo Customer Photos - Send us your photo! Our new puppy Hope wearing her cool camo harness. Posted On 11/26/18 by Lubbock from Lubbock, TX Yes, Lubbock recommends this product! I love the Cha Cha harnesses as they are well made and come with matching leash. They do run a bit small however - my 13 pound poodle mix has this vest in a large and it just fits her - she would wear a medium in most other brands. Great fit for my chihuahua. Was nervous that the velcro closure wouldn't be strong enough. Happily I can say j was wrong. Have gotten so many compliments on it and have never seen it on another pup. Posted On 11/09/13 by Monica M from Lake Geneva, WI Yes, Monica M recommends this product! This is a really cute & practical harness. A size small fits both my girls & even my pup who is right in between a small & medium size. It washes & wears great. The coordinating leash is really convenient. It's a great buy...I have this in the green, too, and love it!